0900hrs - Leighton Moss - Lower Hide - "Blue Damselflies and Marsh Harriers"
A hatch of hundreds if not thousands of a "blue damselfly" in other words a massive swarm! Also a couple of separate Marsh Harriers certainly brought lots of attention from the many local breeding Black Headed Gulls, Lapwings and Oystercatchers. 0800hrs Dalton Crags - "Both Cuckoos seen together"
Confirmed from a good source that both of the Dalton Crags Cuckoos were actually seen together this morning. I am going to enjoy showing a good friend of mine some of the rare beautiful specimens of Angular Solomon's Seal which we have amid the limestone grykes of Hutton Roof. He is itching to get a good photograph. I was able to check out some of the usual best specimens locally at both Clawthorpe Fell and within Dalton Crags. It soon became quite apparent that the species this year was certainly not showing at its best in that the flowers seemed of poor number per ratio to the plant this year by comparison to past years. Also the flowers that were showing this year, seemed creamy in colour (not so much their normal fresh white appearance) even "bedraggled" or watery and almost transparent towards their tips, perhaps another sign of them going past their best. Yet if this was the case, it does seems strange that I got my best specimen photographs last year much later, in fact it was on June 12th (2 weeks later). So have they flowered early this year, or was it that they were much later flowering last year. I will have to check my records over the past five years to get the answers! Also checking out the nearby Lily of the Valley populations, a large patch of some 30ft radius, and again it was a 75% "gone over" situation in most cases, with specimens showing white, some creamy and some with burnt brown tips! Good early specimens of the rare (but locally common) Rigid Buckler Fern, and also another rarity of the Mountain (or Black) Melick Grass, also some of the grykes had beautiful fresh Limestone Ferns (or the Limestone Polypody). 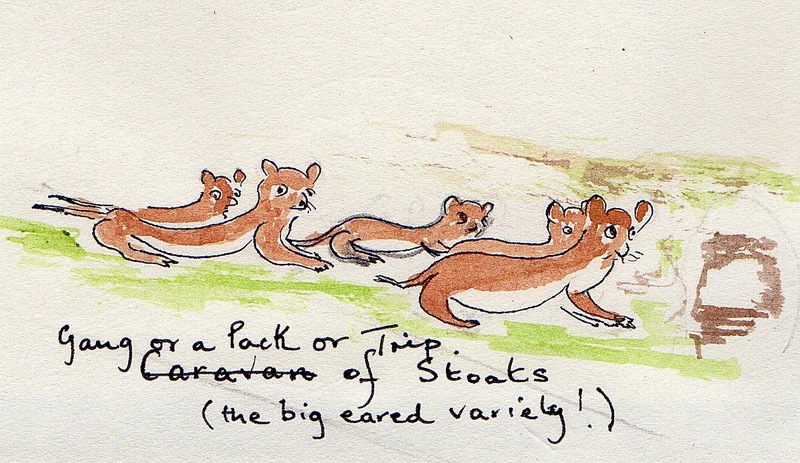 Surprise, surprise, whilst travelling to Milnthorpe, just after leaving the village of Holme and on the first clear stretch (without houses), I took the corner and travelling towards me on the opposite side of the narrow road were a "gang or a pack or a trip" of Stoats, yes five of them all fully mature adults, a splendid sight and one I can say I have never seen anything like before. For a instant It took my mind straight back to my childhood when Tarka the Otter was running down the side of the road. Although they moved with haste whilst at the same time squabbling with one another, and bumping into one another and criss crossing over one another's path, at the same time they did try to keep some sort of regimental order, if you dare call it that. I thought I may have seen this situation with perhaps a mother and her kits, but not five equally sized adults! You automatically think about their safety, but no sooner had I seen them and they were gone, because at that near point they left the road in a follow my leader order and entered a small opening in the hedgerow and I presumed will have gone through to the safety of the field at the other side. I wonder why they where grouped like this at this time of the year? Enjoying checking out Fly Orchids especially the ones on the road verges, really good specimens and at their prime, some five or six flowers to one stalk. Also a magic field with Greater Butterfly Orchids sprouting here, there and everywhere. Lots of Common Twayblades about. 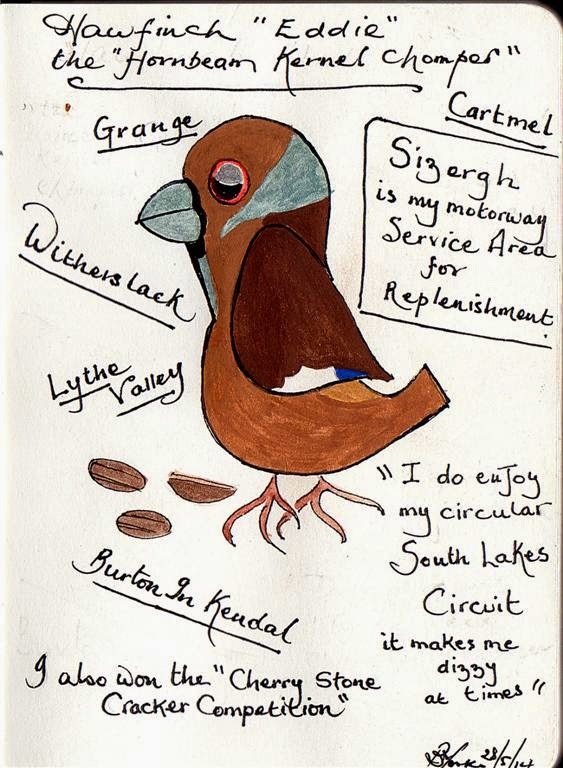 It is my intentions shortly to do a small blog on the "Hawfinches of Sizergh" with lots of help from Rob, and here below is a little scribble I did last night of that fabulous little "dumpy cheekie chappie" Ed - "The Hornbeam Kernel Chomper of Sizergh"
"Hawfinch Eddie the Sizergh Hornbeam Kernal Chomper"
Becoming a regular now, the Redstart opposite Nineteen Trees was calling again from the same spot. Spent absolutely ages (30 minutes plus) listening to a Blackcap which was within twenty feet from where I stood. It was explosive, just wish I could have recorded it and been able to share it with you, it was so special, and I was so privileged. My attention was drawn to it purely by the speed and intermittent delivery of its song, for a second or two you could easily have thought it to be a "Whitethroat". There were several Blackcaps going for it this morning along with a couple of Garden Warblers, Chiffchaffs and Willow Warblers. In the distance I could hear the Cuckoo calling, again from far away in the distance, and from the direction behind Crag House to the North East Side of Dalton Crags. I quickly paced back and plotted my course in the direction of the calling bird. 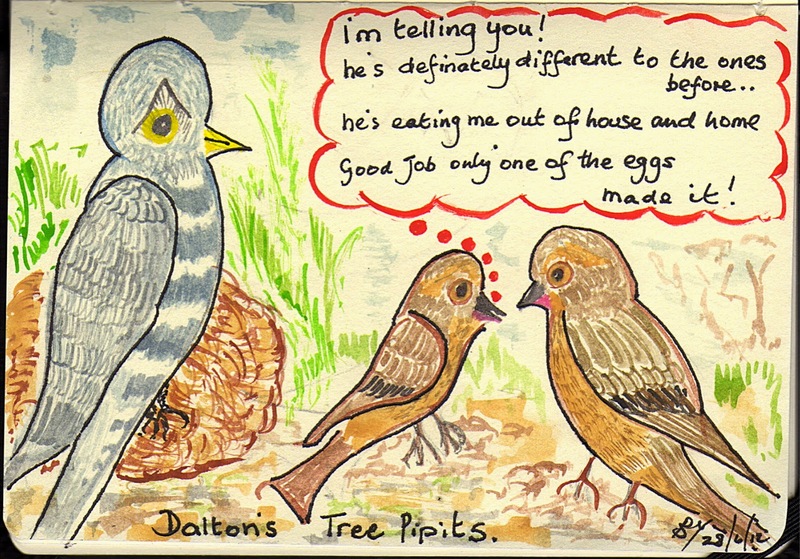 The reason I showed such eagerness to follow the call was that the Cuckoo I was hearing actually had the full two clear syllabels (Cuck-oo), but this one was really going for it, almost non stop over one hour at least. So I just wanted to make sure it was our "regular" Cuckoo and not a new one moved into the territory. Sure enough as I got closer I could confirm that it was our regular one, but the good news is that it has regained 95% of its "honour" with most of its call sounding just like you would expect from a Cuckoo with just now and again a small hiccup with a "Cuck - Cu". Weird as it may be, but this was also a similar experience to last year, the bird arrived with the "Cuck cu", yet after a week or two of its arrival, it then also reverted back to the full call. On the way back found lots of the Long-stalked Crane's-bill (Geranium columbinum). The first thing on reaching the junction from Nineteen Trees and Dalton Lane was that same Common Redstart I had a couple of days ago, singing its little heart out from more or less the same spot. After leaving Plain Quarry I had a singing Garden Warbler from a new area in the lower crags. Also the Cuckoo was Cuckka..ing from somewhere over the Crag House side (distant). A new arrival in the upper deforested was a Lesser Whitethroat which was happily singing away. All the local Tree Pipits seemed happy enough doing their crescendo's whilst at the same time parachuting from the high levels to the lower levels. On the way back a female Blackbird crossed my path carrying nesting material so can only imagine the bird has been previously disturbed and is retrying. Looking forward to checking out the Burton In Kendal Swift's this evening.